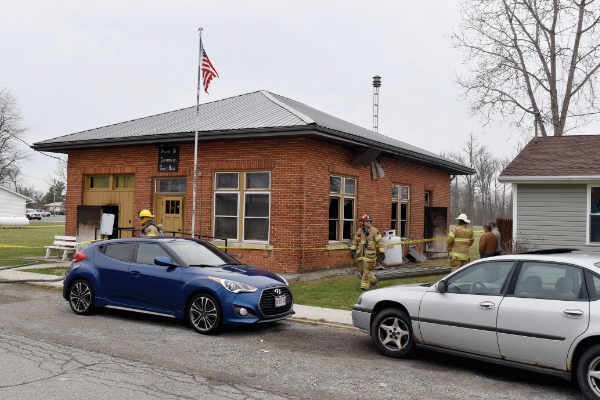 CLOVERDALE — Following an investigation on Monday, investigators with the Ohio Fire Marshall’s Office determined a fire that gouged out the Cloverdale Town Hall early Sunday morning was deliberately set. Putnam County 911 dispatchers received a call at approximately 4:20 a.m. reporting a fire at 210 Mahoning Street. By 4:37 a.m., firefighters with the Kalida and Ottoville Volunteer Fire Departments were on scene, reporting smoke coming out from all four sides of the building, though no flames were immediately evident. The scene was cleared by all firefighters by 6:30 a.m., though emergency personnel returned to the scene at around 9 a.m. for a reported rekindling. Despite the potential for catastrophe, the contents of the building received remarkably little damage. That piece of good news helped buoy spirits of village officials, eliminating the possibility of their actions proving unauditable by the State of Ohio; a situation in which the village found itself in the aftermath of the tornado that devastated the village in 2013. “It’s just going to be a major clean-up,” Mr. Burkhart said.